have you ever admired a brush calligraphy design and wondered, "wait...how on earth was that done by hand?! no way i could do that!" Feeling paralyzed when you walk into the art store from all the things. Standing in the watercolor section just staring at all the supplies, then leaving empty handed because it was WAY too overwhelming! So. Many. Brush. Options. Mimicking Pinterest tutorials for faux-lligraphy with a Sharpie, just to realize they look kinda clunky and take for-ev-er. Oogling over in-person workshops, but feeling defeated because there aren't any near you and there's no way you can afford the travel plus the workshop costs! hear what bonnie had to say! I'll share my absolute fav art supplies & why I love using them. 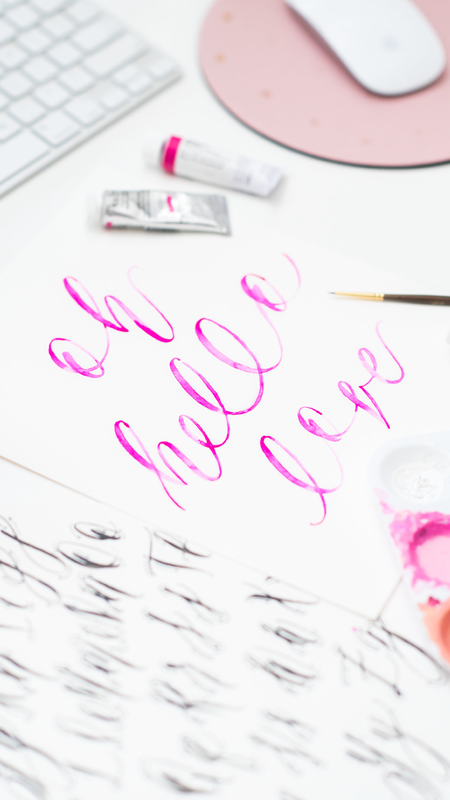 Our art print phrase will be "oh hello love" - my fav! Digital Gift Bag: Super secret surprises from my fav brands! 10% of all full-priced courses will be donated to Hurricane harvey disaster relief efforts! texas is my new home, and thousands in southeast texas have lost their home to this devastating hurricane. it's my goal to raise $5,000 to donate, and i am so thankful for your help with that! When will I get access to the course content? All of the core lessons will be available as soon as you sign up! I want you to focus on learning the core lessons first, so your bonuses will be available at the end of September, to give you 2-3 weeks to really master these basics!